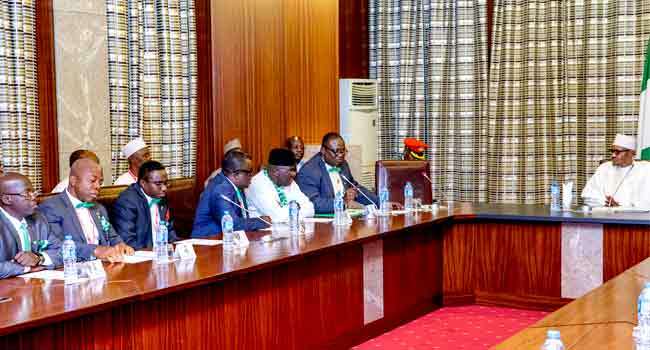 President Muhammadu Buhari in a meeting with NMA executives at the State House in Abuja on July 19, 2018. President Muhammadu Buhari has appealed to medical doctors to avoid going on strike but consider other means of negotiation for better working conditions. He said this on Thursday when he received the new executive of the Nigerian Medical Association (NMA) at the Presidential Villa in Abuja, the nation’s capital. The President asked them to always see their profession as a divine call, especially in taking decisions that directly impact on the lives of Nigerians. “The medical profession is regarded as a divine call because of the strategic role you play in the lives of human beings,” he said in a statement by his Special Adviser on Media and Publicity, Mr Femi Adesina. 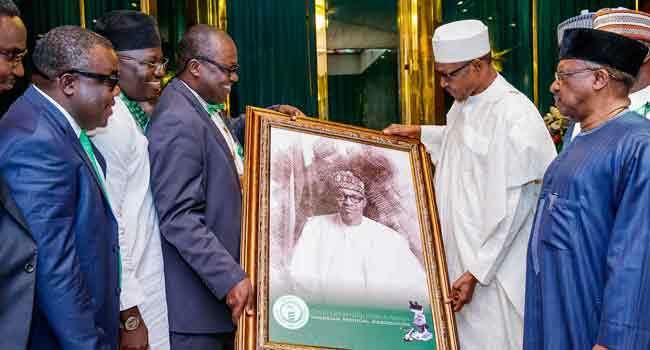 President Buhari revealed that the Federal Government was considering an upward review of budgetary allocation to the health sector, in order to improve the quality and access to medical facilities across the country. He was hopeful that the review of the budgetary allocation would reflect the government’s priority of ensuring that Nigerians get better healthcare, especially in specialised areas. “We place quality healthcare on our priority list, and we are already marching on with the primary healthcare services and some state governors have bought into it. We are committed to universal health care,” the President added. He also assured the NMA leaders that the White Paper from the Ahmed Yayale-led panel report on Inter-Professional Harmony in the Healthcare Sector was already being considered by the government to ensure more organised and harmonised working relationships among medical practitioners. President Muhammadu Buhari receiving a presentation from NMA President Dr Francis Faduyile and other members of the leadership at the State House in Abuja on July 19, 2018. President Buhari commended the association and its members on some of the medical feats being achieved in Nigeria, including the separation of conjoined twins, organ transplants, heart surgeries and treatment of cancer patients. He also informed them that the Nigerian Medical and Dental Council would soon be constituted to further enhance service delivery and regulation of the sector. In his remarks, the Minister of State for Health, Dr Osagie Ohanire, was optimistic that a newly released basic healthcare provision would further focus on improving service delivery to Nigerians through the primary healthcare. The NMA President, Dr Francis Adedayo, commended the President for including members of the NMA in the Federal Executive Council and assenting to the Medical Residency Training Act. He also urged the Federal Government to improve the budgetary allocation to the health sector, as required by the Abuja Declaration which sets a benchmark of 15 per cent. Dr Adedayo noted that the speedy processing of the Ahmed Yayale report on harmony among practitioners in the medical sector would go a long way in enhancing service delivery and better working relationships. He hinted the President that the NMA had already reached out to the National Emergency Management Agency (NEMA) for stronger partnership in providing care for victims of disasters.